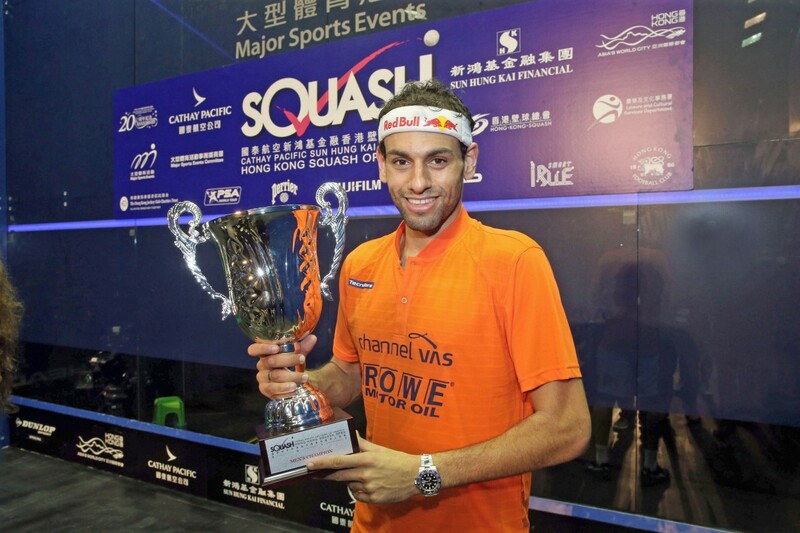 ElShorbagy captured his third successive PSA World Tour title - and the 29th of his career - after an 11-6, 5-11, 11-4, 7-11, 11-3 victory over Farag in 64 minutes at the Hong Kong Park Sports Centre saw him pick up his third Hong Kong Open title after also winning the tournament in 2014 and 2015. "We’ve played so many battles in the last few weeks and I want to congratulate him and all of his team," said ElShorbagy, who overtakes World Champion Karim Abdel Gawad to move back up to No.2 in the World Rankings. "He’s played unbelievable squash at the last few tournaments and I’m looking forward to having many more battles with him in the future. "I’m happy I’m playing well again this year, I’ve done a lot of work this summer and I’m really proud with the way I’ve started this season, but there is still a long season ahead. I’m going to enjoy this trophy for a day or two and then I will look forward to my next event." ElShorbagy’s victory sees him strengthen his lead atop the PSA World Series Standings to 75 points over second-placed Farag after three World Series tournaments played, with El Sherbini moving up to second behind El Welily. Points are on offer at all eight World Series tournaments throughout the 2017/18 season and, after adding the Hong Kong Open title to his Qatar Classic crown from earlier this month, the Bristol-based Egyptian is odds on to qualify for a top-eight berth, which would guarantee him a place in June’s season-ending PSA World Series Finals. El Welily overtakes Nour El Tayeb to lead the way on the women’s standings after also reaching the U.S. Open final, but holds just a slender five-point advantage over El Sherbini. 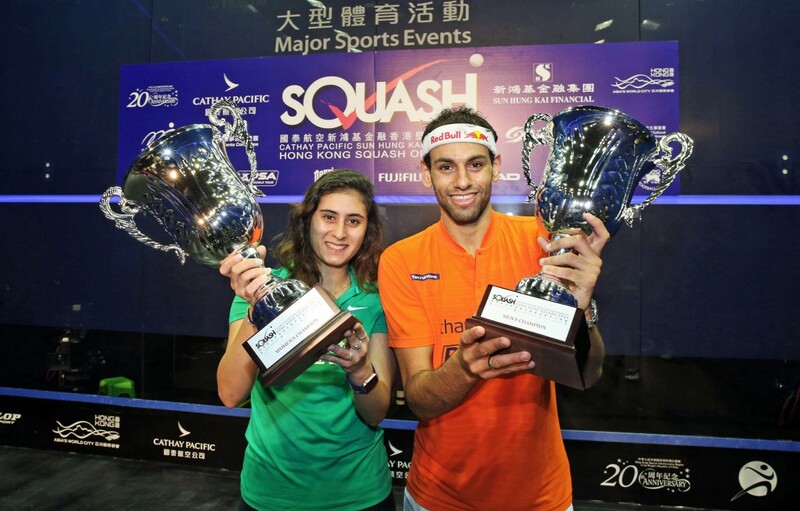 The Cathay Pacific Sun Hung Kai Financial Hong Kong Open will feature two all-Egyptian finals for the first time in its 32-year history after Mohamed ElShorbagy, Ali Farag, Nour El Sherbini and Raneem El Welily all claimed wins on semi-finals day at the PSA World Series tournament held at the Hong Kong Park Sports Centre. “I’ve put in a lot of hard work this summer to be back playing finals again, it’s what I live for. It’s my sixth PSA final in a row and I’m really happy to have my form back again and to be competing in finals." 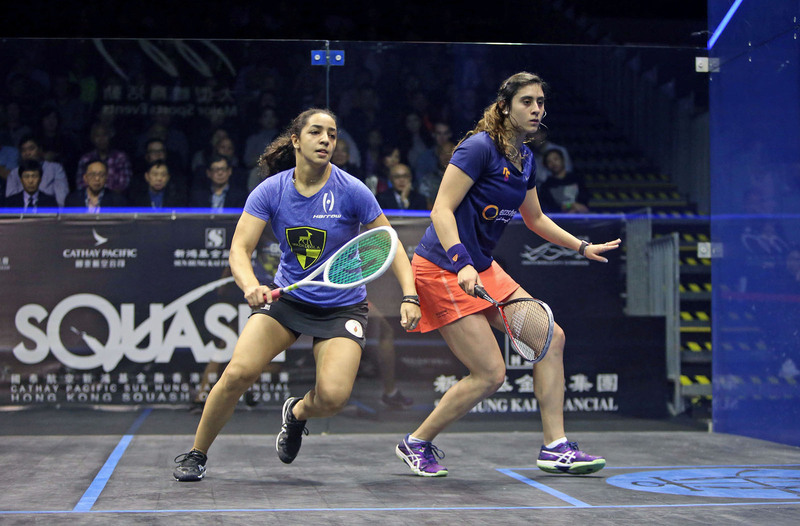 The first ever all-Egyptian women’s Hong Kong Open final will be a repeat of April’s PSA Women’s World Championship as El Sherbini and El Welily battle for their first World Series titles of the season. El Sherbini defeated 2015 runner-up Laura Massaro after coming from 2-1 behind to claim her place in the title decider. 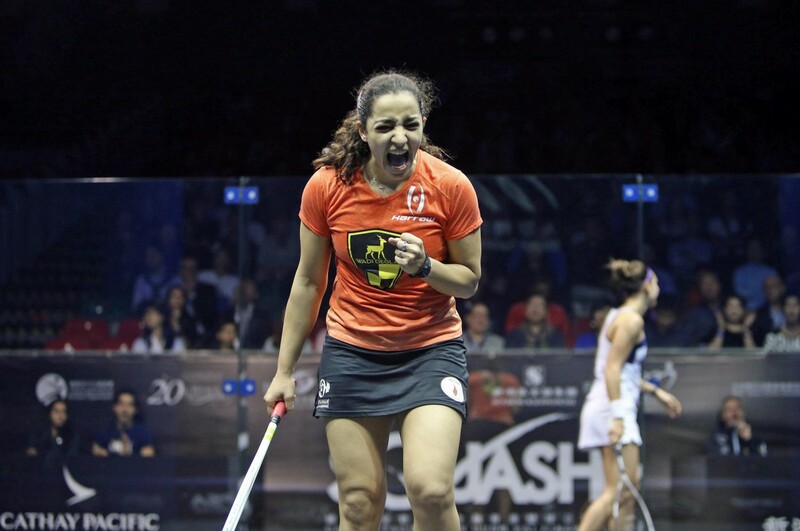 Two-time runner-up El Welily, meanwhile, dispatched World No.3 Camille Serme in five games to reach her second World Series final of the season after she lost out to compatriot Nour El Tayeb in the final of the U.S. Open in October. “I didn’t think I had anything left in the tank, but in the second, my coach gave me the push I needed, my husband [men’s World No.7 Tarek Momen] too. The final of the Hong Kong Open will take place from 16:00 local time (HKT) tomorrow (November 19th). Both finals will be shown live on SQUASHTV (rest of world) and Eurosport Player (Europe only), while they will also be shown live on mainstream broadcast channels around the world, including BT Sport, beIN Sports, Fox Sports Australia and Astro. 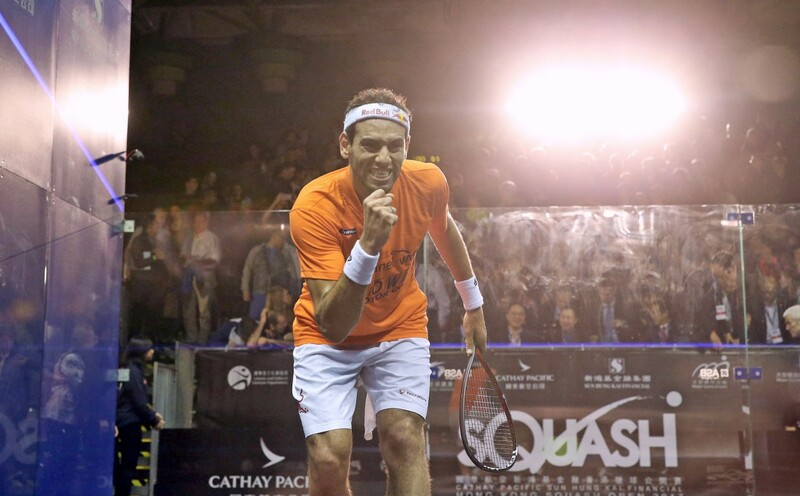 There will be an all-Egyptian semi-final line-up in a men’s PSA World Series event for the first time in history after Mohamed ElShorbagy, his younger brother Marwan, Karim Abdel Gawad and Ali Farag prevailed on quarter-finals day to reach the last four of the 2017 Cathay Pacific Sun Hung Kai Financial Hong Kong Open. The Bristol-based ElShorbagy brothers, Mohamed and Marwan, will face each other for a place in the final in what will their 10th meeting on the PSA World Tour after they defeated Mohamed Abouelghar and World No.1 Gregory Gaultier, respectively. Both players won in four games to set up the latest instalment of their brotherly rivalry, with Marwan winning their last two matches, including an emotional victory during the Windy City Open last February. “I miss these matches, we [Marwan and Mohamed] played four times last season and I miss being on court with him somehow," said Marwan. "I miss going into a tournament knowing that I would play him. I still hate playing him, but I miss these moments. They will be joined in the last four by World Champion Karim Abdel Gawad and U.S. Open winner Ali Farag. 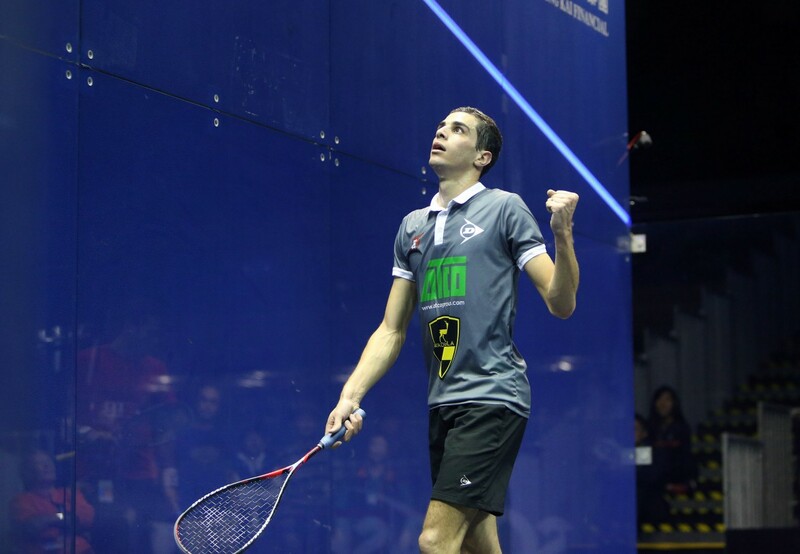 Gawad overcame fellow Egyptian Tarek Momen by a 3-1 margin, while Farag defeated Declan James by the same scoreline to write their names into the history books. "We know we have very good players in Egypt and we are all around the same age, from 23-26 years old," said Gawad. "We're young and we've been competing with each other since we were kids. I'm really glad that I'm one of the players to reach the semi-finals. Hopefully we can always do great things for our sport." 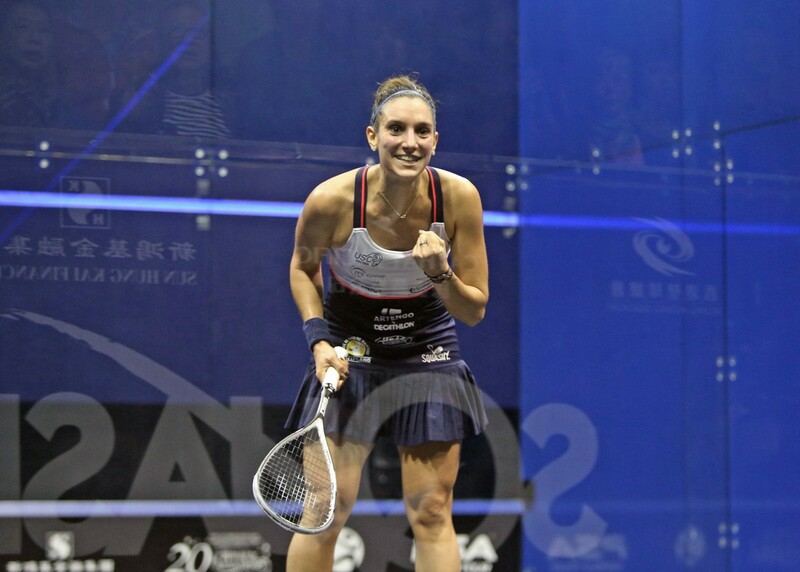 History was also made in the women’s event as World No.3 Camille Serme finally claimed her first ever win over 10-time Hong Kong Open champion Nicol David on the PSA World Tour at the 17th attempt. Since first meeting in 2008, Serme had never got the better of the eight-time World Champion and had only taken more than a solitary game on one occassion previously to their quarter-final clash. But at the Hong Kong Park Sports Centre, Serme - who lost to David in the 2012 final - attacked well and kept her composure to end her unwanted streak. “It was a very tough game, it’s always a battle with her even if she’s not at the top of the rankings any more,” Serme said. “She’s still a great player and I knew it was going to be hard. I can’t believe I have just done it. I think I had to attack and make her work at the front of the court as much as I could. Serme will clash with El Welily - who she has beaten just once in seven matches - after El Welily came through a five-game cracker with Joelle King, winning it 14-12 in a nail-biting decider. “I have no idea how I managed to pull that one off,” said El Welily. “I had to go for the winners as much as I could because if I played basic squash she would play a winning shot, so I had to steal it before she did. All credit to her, she played a really good match." World Champion Nour El Sherbini and World No.4 Laura Massaro will meet in the day’s other semi-final. El Sherbini dispatched defending champion Nouran Gohar in just 27 minutes, while Massaro was made to work hard by Welsh No.1 Tesni Evans, but came through to win in four games. The semi-finals of the Hong Kong Open will take place from 15:00 local time (HKT) tomorrow (November 18th). All four matches will be shown live on SQUASHTV (rest of world) and Eurosport Player (Europe only), while it will also be shown live on mainstream broadcast channels around the world, including BT Sport, beIN Sports, Fox Sports Australia and Astro. 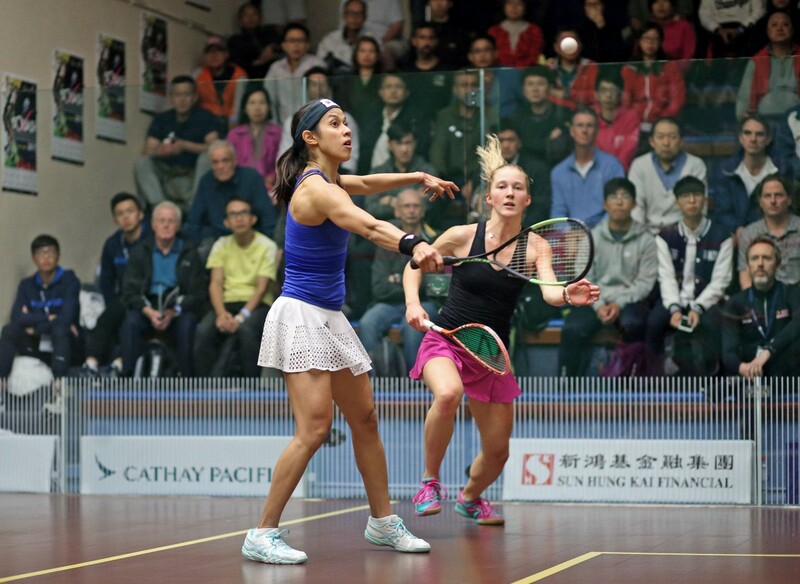 Malaysia’s eight-time World Champion Nicol David and Egypt’s World No.4 Ali Farag overcame Hong Kong siblings Annie and Leo Au on day three of the 2017 Cathay Pacific Sun Hung Kai Financial Hong Kong Open, PSA World Series event to reach the quarter-finals. Annie ended a 17-match losing streak against David last month at the U.S. Open and she came within a whisker of making it back-to-back wins over the Hong Kong Open champion. David required a late fightback after falling 2-1 behind, with the eight-time World Champion claiming an 11-9, 9-11, 7-11, 11-9, 11-7 victory to set up a quarter-final meeting with French World No.3 Camille Serme, who also came out on top against Hong Kong opposition as she beat World No.19 Joey Chan. “She always plays well here, so I knew I had to really be on it today,” said David. “I stayed focus, but she played really well today. I had a little lapse but I knew I needed to go up another level and I performed really well, stuck to my game plan and I’m really pleased to win that 3-2. Elsewhere, two-time runner-up Raneem El Welily overcame fellow Egyptian Nour El Tayeb in a repeat of their U.S. Open final clash last month, avenging that defeat in Philadelphia with an 11-8, 11-13, 11-7, 9-11, 11-9 victory. 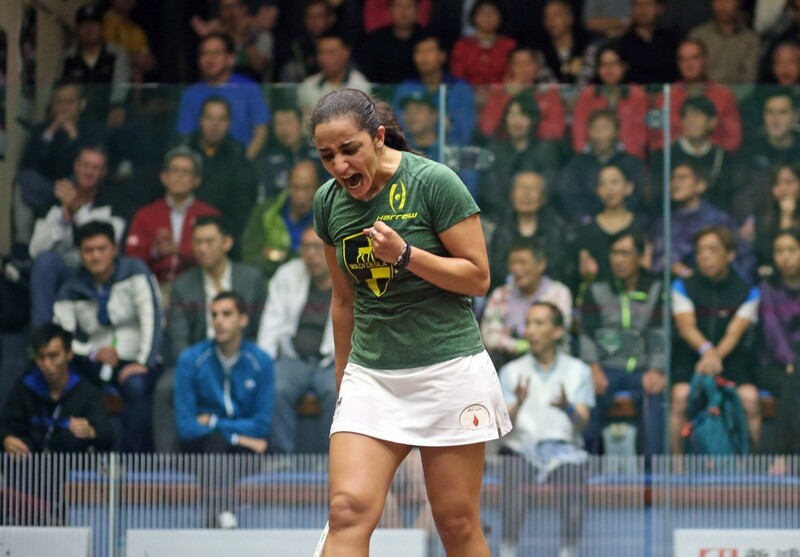 "I’m very happy to win today, it wasn’t easy at all,” said El Welily. El Welily will take on New Zealand’s World No.9 Joelle King after she upset England’s Sarah-Jane Perry, while World Champion Nour El Sherbini will face defending champion Nouran Gohar. The Egyptian duo claimed respective wins over Donna Urquhart and Joshna Chinappa, with World No.4 Laura Massaro and Tesni Evans completing the quarter-final line-up. Massaro got the better of United States No.1 Olivia Blatchford, while Evans will become the first female Welsh player to appear in the quarter-finals of a World Series event after she defeated World No.10 Alison Waters. Tournament wildcard Leo Au made headlines yesterday after he blew the men’s draw wide open with a stunning win over last year’s winner Ramy Ashour but he was unable to back up that victory, retiring mid-way through the second game of his clash with Farag. 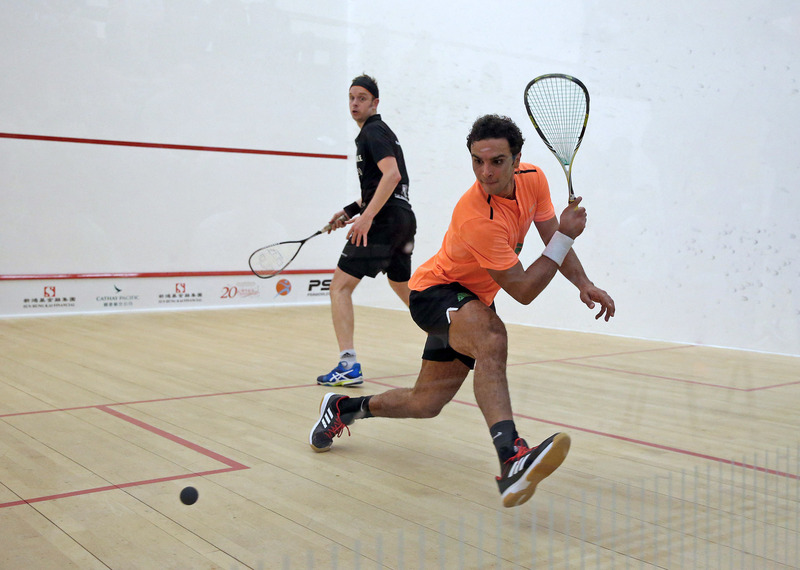 “It’s never pleasing to win that way,” admitted Farag. “He had a great match yesterday and I was ready for a big fight tonight, but it was unfortunate for him. 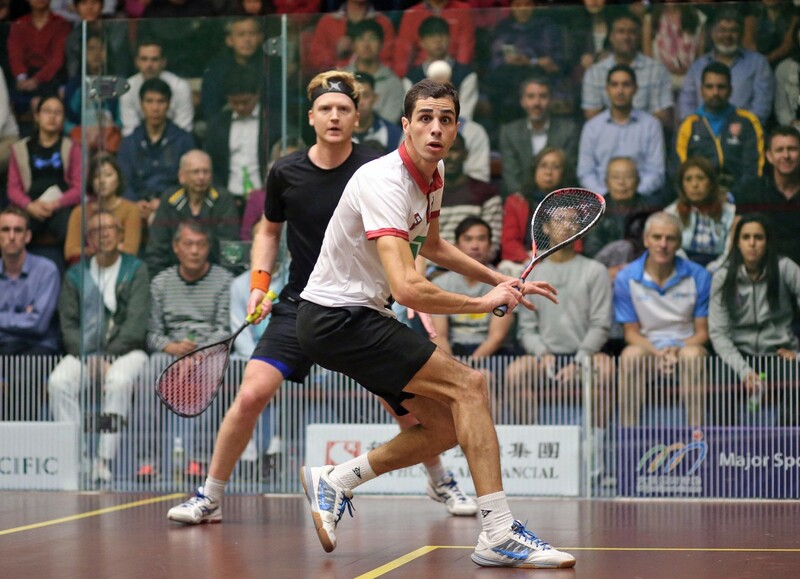 Farag will line up against English qualifier Declan James, who moved through to a maiden World Series quarter-final after his second round opponent, World No.8 Fares Dessouky, pulled out through a knee injury while the Egyptian was two games ahead. World No.1 Gregory Gaultier is also through to the last eight after he came from behind to beat New Zealand’s Paul Coll 2-11, 11-7, 8-11, 11-9, 11-6, despite an out-of-sorts display from the Frenchman at times. “It took me a while to adapt, I felt really slow and couldn’t see the ball,” said Gaultier. “The ball was so fast at the beginning of the match, I didn’t have my movement either. I had to really push myself in the second to produce something. I fought with my head because I was struggling to be accurate or move fast off the ’T’ and it was tough, he was always recovering the shots and playing at a fast pace. 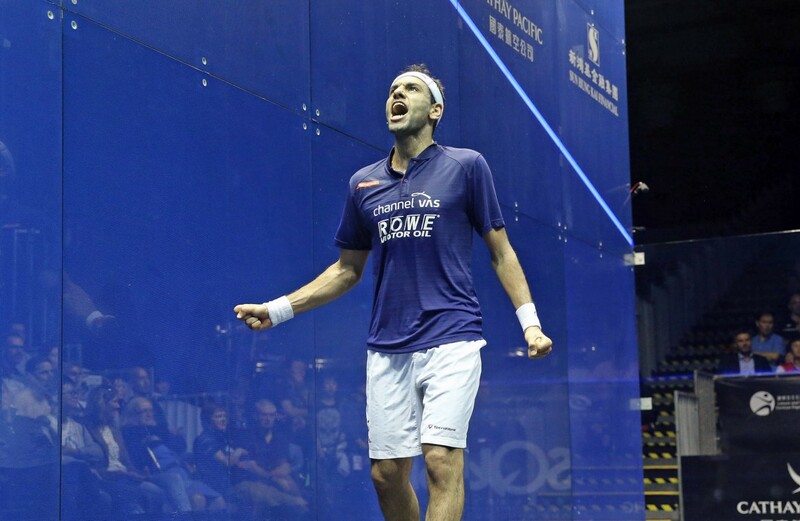 Gaultier goes through to play World No.6 Marwan ElShorbagy, while Marwan’s older brother, World No.3 Mohamed, defeated French qualifier Lucas Serme to set up a quarter-final meeting with Mohamed Abouelghar, who saw off Germany’s Simon Rösner in straight games. There were also wins for 2016 runner-up Karim Abdel Gawad and Tarek Momen, who will go head-to-head for a place in the semi-finals. The quarter-finals of the Hong Kong Open begin tomorrow (November 17th) and all of the matches will be shown live on SQUASHTV (rest of world) and Eurosport Player (Europe only). 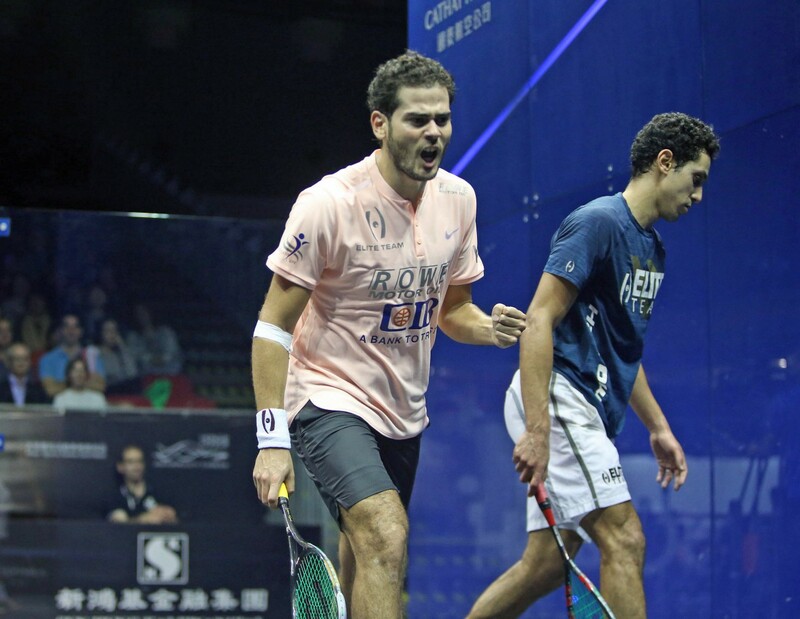 Tournament wildcard Leo Au caused one of the biggest ever shocks to have graced the Cathay Pacific Sun Hung Kai Financial Hong Kong Open after the Hong Kong No.1 sent defending champion Ramy Ashour crashing out on day two of the PSA World Series event held at the Hong Kong Squash Centre. Illness had put Ashour out of action since winning September’s J.P Morgan China Open and the three-time World Champion struggled to break down a tenacious Au who, buoyed by his home crowd, recovered from a one-game deficit to go 2-1 up but the World No.26 surrendered a match ball to send the match into a decider. Ashour fought back from 4-0 down to level in the fifth game but he quickly began to fatigue and Au took full advantage, playing some sublime squash as he racked up seven points on the bounce to claim the biggest win of his career. "I feel amazing because I didn’t expect much before the match,” said Au, who will compete in the second round of the Hong Kong Open for the first time. “When I lost that match ball, I thought I had lost the match. Au will face the in-form Ali Farag for a place in the quarter-finals after the U.S. Open champion defeated English qualifier Tom Richards by a 3-1 margin. “I’m delighted, it’s not easy to be the last one on against Tom on a court like this, it suits his gameplan quite well,” said Farag. 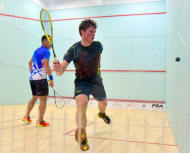 Elsewhere in the draw, World Champion Karim Abdel Gawad dispatched Mexico’s Cesar Salazar in four games, while Australia’s Cameron Pilley beat German qualifier Raphael Kandra to ensure that he will face the 2016 runner-up in the next round. England’s Declan James upset Saurav Ghosal to reach the second round of a World Series event for the first time and he will take on World No.8 Fares Dessouky next. World No.7 Tarek Momen and 2016 semi-finalist Ryan Cuskelly will also line up in another of the quarter-final fixtures after they beat Alan Clyne and Adrian Waller, respectively. 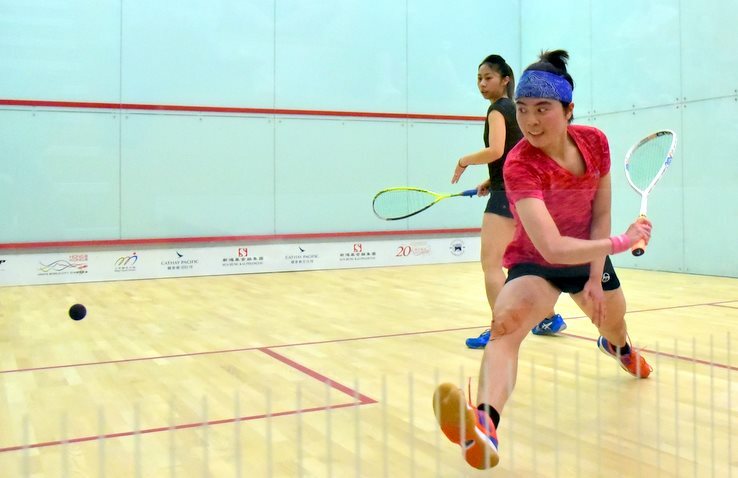 The female Hong Kong No.1, Annie Au, followed in brother Leo’s footsteps as she also advanced to round two, beating compatriot Tong Tsz-Wing by an 13-11, 11-9, 11-3 scoreline. "I was really pleased to win the first two games because they were really close,” said Annie. “I think Tong played really well today and I wasn’t really in the moment for the first two games because I wasn’t moving very well. In the third game, I managed to come back and was more attacking. “I tried to volley as much as I could [in the third game] to put her under more pressure and it worked well." Annie ended an eight-year, 16-match losing streak against 10-time Hong Kong Open champion Nicol David during last month’s U.S. Open and she will face the legendary Malaysian once more after David overcame Canadian qualifier Danielle Letourneau 11-2, 11-6, 9-11, 11-3. David eased to comfortable victories in the opening two games but World No.45 Letourneau proved to be a dogged competitor as she fought back to take the third. From there, it was all World No.6 David though as she closed out the win to make it through to the last 16. “It’s great to be back here, Hong Kong is a special place for me, there are a lot of memorable moments here, I won my first World Championship title here and there’s a great vibe," David said. “There are a lot of familiar faces and good memories here, so I always come in with a good buzz when I step on the glass court. 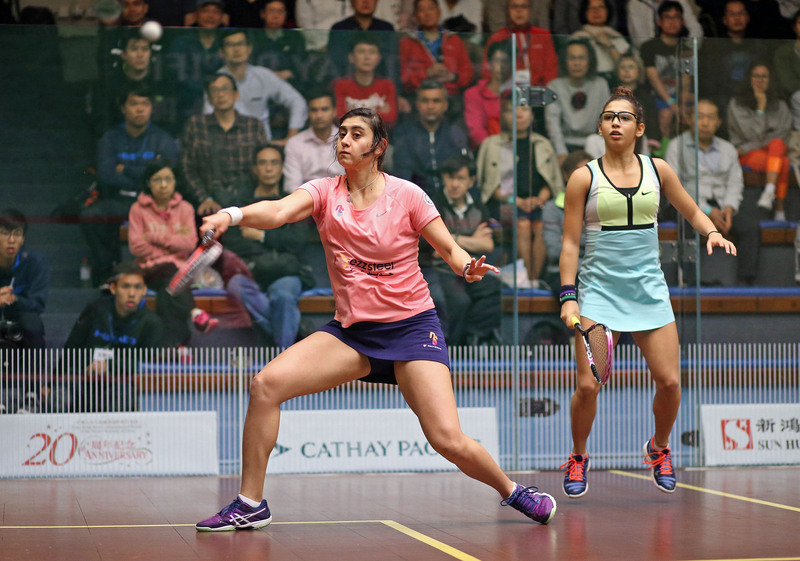 World No.2 Raneem El Welily and World No.8 Nour El Tayeb will face off in a repeat of the U.S. Open final after they beat Dipika Pallikal Karthik and Fiona Moverley, respectively, while World No.19 Joey Chan upset World No.12 Emily Whitlock to join the Au siblings in representing Hong Kong in the next round. 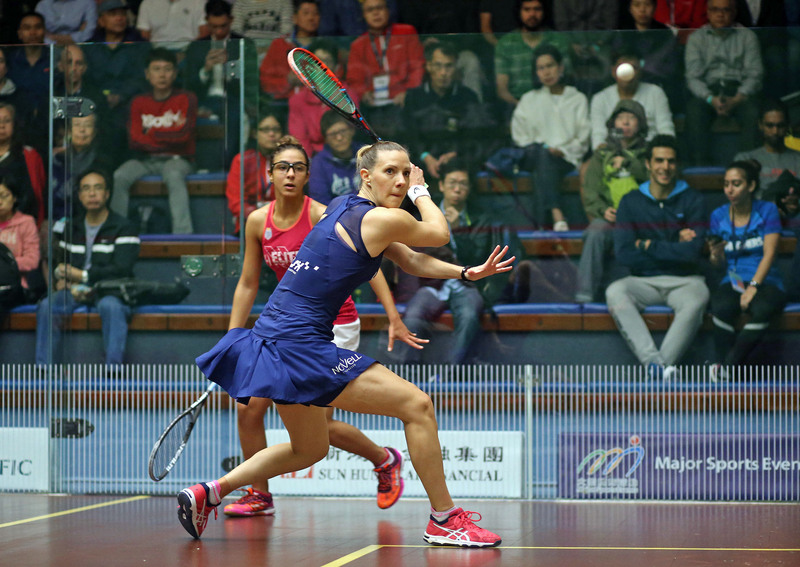 World No.3 Camille Serme awaits Chan after she cruised to victory against Malaysia’s Rachel Arnold, while World No.9 Joelle King and World No.7 Sarah-Jane Perry also claimed wins on day two. The second round of the Hong Kong Open begins tomorrow (November 16th) and selected fixtures will be shown live on SQUASHTV (rest of world) and Eurosport Player (Europe only). 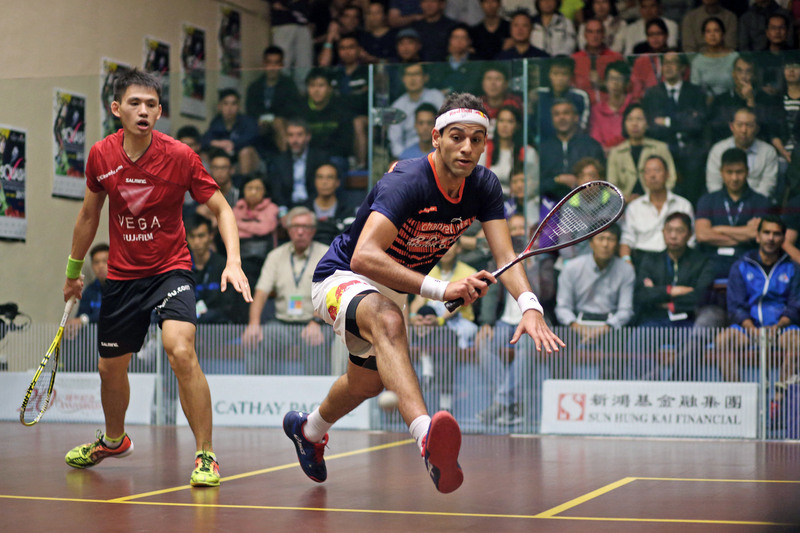 World No.3 Mohamed ElShorbagy prevailed in an entertaining five-game affair with World No.28 Max Lee to send the local favourite out on day one of main draw action at the 2017 Cathay Pacific Sun Hung Kai Financial Hong Kong Open, the third PSA World Series event of the 2017/18 season. The Bristol-based Egyptian has been in spell-binding form this season, winning three of four tournaments, and was looking to improve on a disappointed second round exit at last year’s tournament. Lee delighted the home fans in the 2016 edition as he reached a maiden World Series semi-final but he went down 11-7, 2-11, 12-10, 10-12, 11-4 in 68 minutes to bow out in round one of the latest instalment of the long-running tournament. 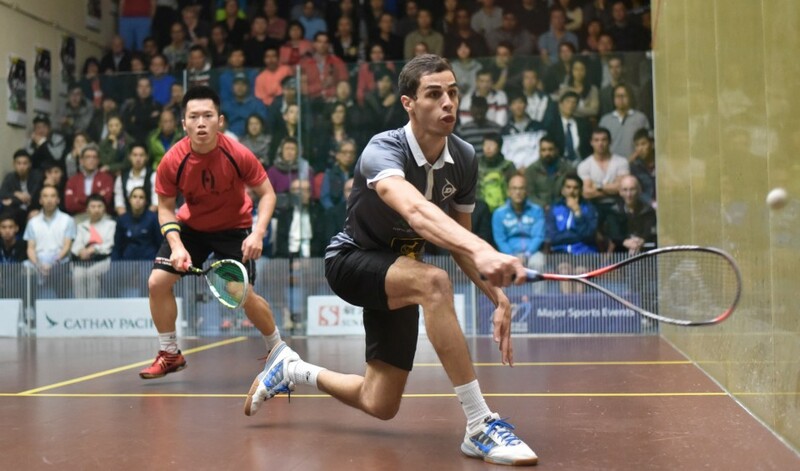 "I think Max played well, it was always going to be difficult playing him on his home court," said ElShorbagy. "I felt a little flat mentally, but it was the perfect first round to sharpen me up. This is my fifth tournament in a row and I’ve played more matches than anyone else so far this season but these are the kinds of situations you want to be in, you want to challenge yourself and I was up to that challenge. "I played a very good fifth game, it was a very tricky match and I used all of my experience." Elsewhere, World No.13 Mohamed Abouelghar was in superb form to dispatch England’s former World No.1 James Willstrop, running the Yorkshireman ragged en route to claiming the win by an 11-2, 11-9, 11-9 margin. Abouelghar will face recent Qatar Classic semi-finalist Simon Rösner in round two after the German overcame France’s Mathieu Castagnet, while ElShorbagy will take on French qualifier Lucas Serme after he upset former World No.3 Omar Mosaad. World No.1 Gregory Gaultier is also through after coming out on top in an all-French affair with Gregoire Marche and he will take on New Zealand’s World No.9 Paul Coll for a place in the last eight after Coll beat Indian qualifier Harinder Pal Singh Sandhu. 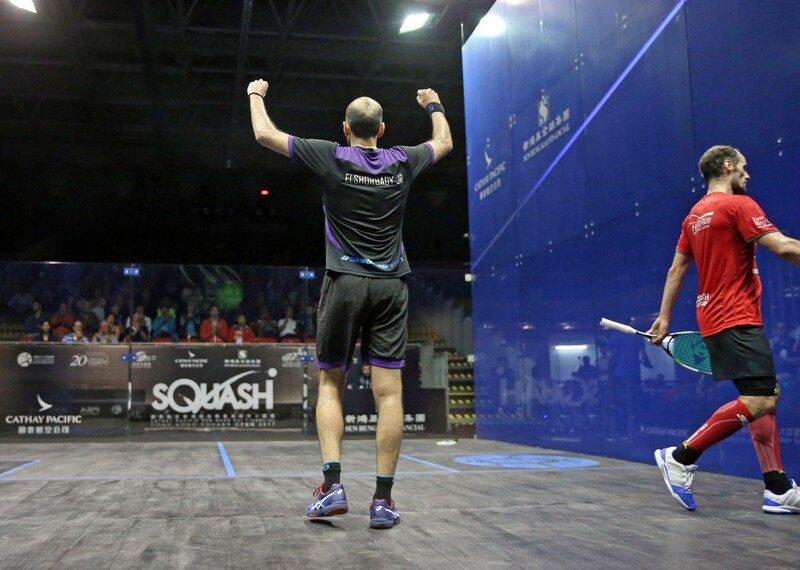 Marwan ElShorbagy and Greg Lobban were the other winners on day one and will go head-to-head in the next round. In the women’s event, World No.1 Nour El Sherbini got her tournament under way with a win over fellow Egyptian Nada Abbas, beating the 17-year-old 11-5, 11-3, 11-1 in just 16 minutes to set up a second round fixture with Australia’s Donna Urquhart. 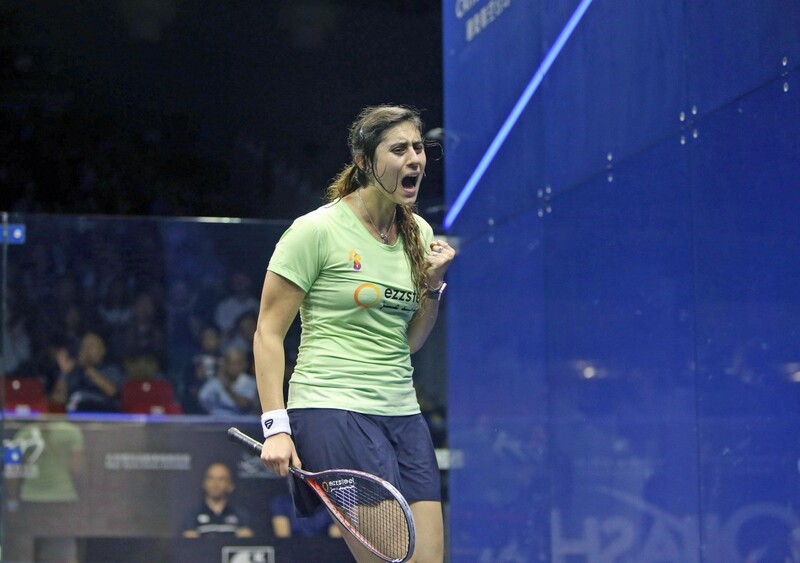 “I’m really pleased, a 16-minute match is really short,” said El Sherbini. “Nada is one of the youngest players, she’s very good and on the way up. I was trying to kill everything quickly and play my game instead of hers. El Sherbini will be joined in the next round by defending champion Nouran Gohar after she saw off tournament wildcard Liu Tsz-Ling in straight games. A win for World No.4 Laura Massaro over Egyptian qualifier Hania El Hamammy means that she is through to the last 16 to face Olivia Blatchford, while there were also wins for Alison Waters, Joshna Chinappa and Tesni Evans. "One of my first coaches said to me when I was Hania’s age that the first time you play a top pro on the Tour, you can sometimes take them by surprise and a true reflection of your level is how well you do the second time," said Massaro, who won over five games when the two played in the first round of last year’s event. "These youngsters can catch you out and play well and they deserve it, but then you get the full respect and full attention of the player for the second time and I think that’s what Hania got today. She deserves my respect because of how well she played last time." First round action from the Hong Kong Open continues tomorrow (November 15th) and selected fixtures will be shown live on SQUASHTV (rest of world) and Eurosport Player (Europe only). The final qualifying round of the 2017 Cathay Pacific Sun Hung Kai Financial Hong Kong Open saw four out of five local players bow out of the World Series tournament, with home hero and second qualifying seed Tsz Fung Yip falling to Scotland’s World No.40 Greg Lobban (right). World No.29 Yip caused a huge shock at last season’s tournament as he delighted the crowd with a win over third seed Miguel Angel Rodriguez but he was on the wrong end of an upset this time around as Lobban played above his seeding to take a 3-1 win. 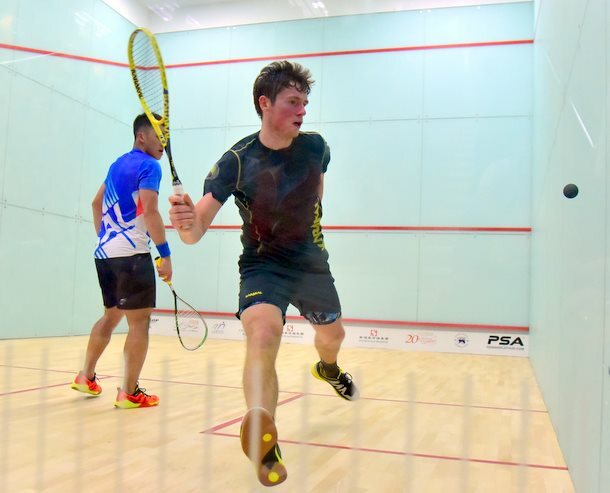 25-year-old Lobban will take on Zahed Mohamed next, while the top qualifying seed Nicolas Mueller also bowed out after falling to Germany’s Raphael Kandra, who added Mueller to a growing list of scalps this season. Elsewhere, Malaysia’s Nafiizwan Adnan came out on top in a titanic five-game tussle with experienced Fin Olli Tuominen to set up a first round clash with Egypt’s World No.8 Fares Dessouky. England’s Adrian Waller also prevailed in five games over Welshman Joel Makin, while Harinder Pal Singh Sandhu will make his Hong Kong Open main draw debut at the sixth attempt after he defeated Egypt’s Youssef Soliman to ensure he will face World No.9 Paul Coll. In the women’s event, World No.49 Tong Tsz-Wing (left) was the sole player from Hong Kong to make it into the main draw. The 25-year-old axed compatriots Fung Ching Hei and Vanessa Chu to emerge from the qualifying rounds unscathed, recovering from a tie-break defeat in the opening game of her fixture with Chu to set up a meeting with Hong Kong No.1 Annie Au in round one of the main draw. World No.46 Ho Tze-Lok was another Hong Kong casualty on the final day of qualifying as she fell to 17-year-old Egyptian Nada Abbas, while Ka Yi Lee also exited the tournament after she surrendered a 2-1 lead against Malaysia’s Rachel Arnold. Meanwhile, 2010 runner-up Jenny Duncalf fell to a surprise defeat against Canadian World No.45 Danielle Letourneau - losing 3-0 in just 23 minutes - and Letourneau will be joined in the main draw by countrywomen Hollie Naughton, who vanquished Haley Mendez of the United States. There were also wins for Nadine Shahin, Hania El Hammamy and Milou van der Heijden. The main draw of the Hong Kong Open will be held at the Hong Kong Squash Centre between November 14-16 before moving to the glass court erected at the arena in Hong Kong Park Sports Centre on November 17-19. Every match from the main draw will be shown live on SQUASHTV (Rest of World) or Eurosport Player (Europe only), while semi-finals and finals will be shown live on mainstream broadcast channels around the world, including BT Sport, beIN Sports, Fox Sports Australia and Astro. 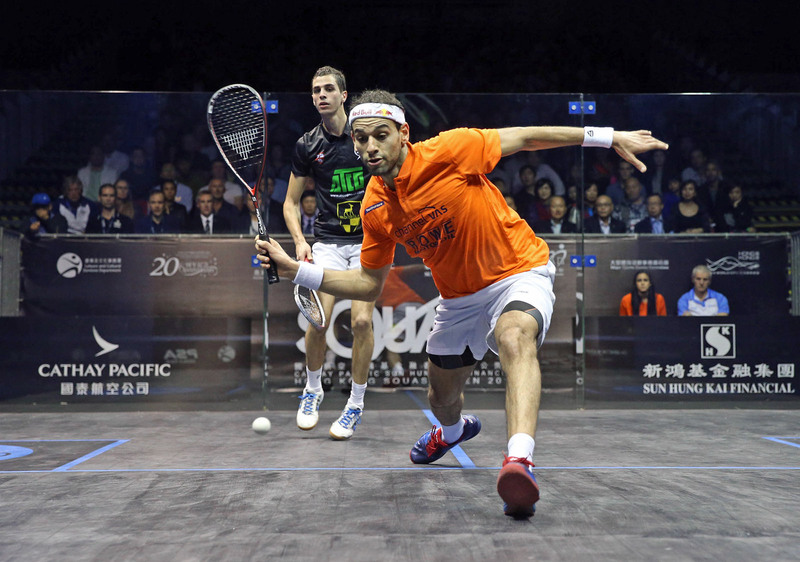 Three-time World Champion Ramy Ashour is hoping to make his first PSA World Series appearance of the 2017/18 season at this month’s Cathay Pacific Sun Hung Kai Financial Hong Kong Open as the Egyptian maverick targets a successful defence of his title. Ashour has won the long-running tournament on three occasions, with his victory over World Champion Karim Abdel Gawad in the final of last year’s Hong Kong Open bringing a 16-month wait for a World Series title to an end. A multitude of hamstring and knee injuries have prevented Ashour - a fan’s favourite - from becoming a regular figure on the Tour over the past three years and he followed up a title win in September’s J.P. Morgan China Open with withdrawals from both the U.S. Open and Qatar Classic, citing internal illness. 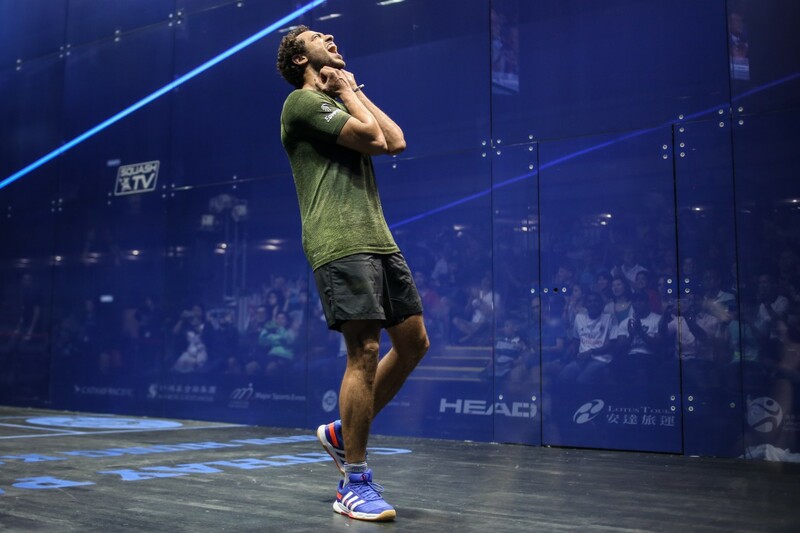 Those withdrawals mean that Ashour currently resides outside of the top eight on the PSA World Series Standings - with the top eight qualifying for a coveted place at June’s PSA World Series Finals - but the 30-year-old says that his fitness is the number one priority ahead of Hong Kong. "Being mentally and physically healthy is more important than anything," said Ashour. "I want to play again because I love my sport and I love and respect the people on social media and around the world who always support me in my ups and downs. "I want to play and win for them because that will be my thank you to them. "[Winning last year was] super special, it's amazing [that there was a 16-month gap] as I never count. I enjoy winning, it's addictive, but you can always play better squash and there is always more to come." Ashour will take on local favourite and tournament wildcard Leo Au in round one, with a win likely to see him pitted against World No.4 Ali Farag in a blockbuster round two clash. World Champion Karim Abdel Gawad is on the same side of the draw, while the top half of the draw features heavyweights such as World No.1 Gregory Gaultier and two-time winner Mohamed ElShorbagy. The women’s event, meanwhile, sees reigning champion Nouran Gohar and World No.1 Nour El Sherbini seeded to meet in the quarter-finals, while Raneem El Welily, Camille Serme, Laura Massaro and 10-time winner Nicol David are also in attendance. The qualifying stages of the 2017 Cathay Pacific Sun Hung Kai Financial Hong Kong Open take place between November 12-13 at the Hong Kong Football Club. 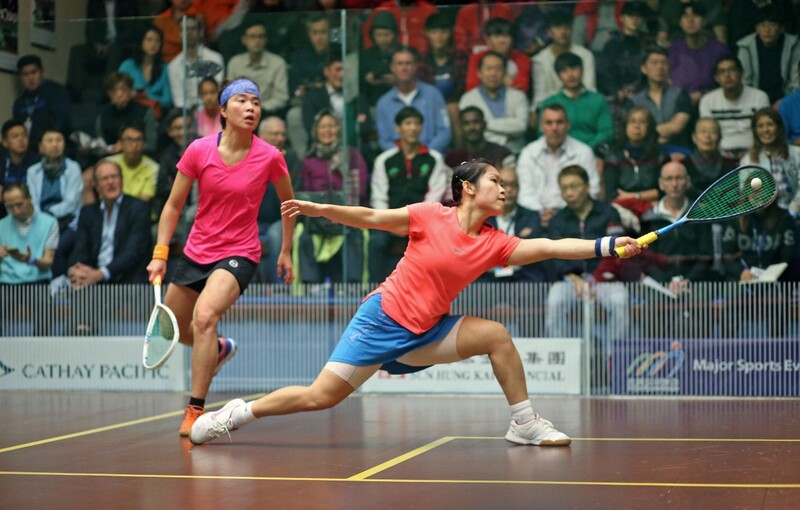 The main draw will be staged at the Hong Kong Squash Centre between November 14-16 before moving to the glass court erected at the arena in Hong Kong Park Sports Centre on November 17-19. The main draw of the 2017 Cathay Pacific Sun Hung Kai Financial Hong Kong Open has thrown up some difficult first round fixtures for the home players on display after the country’s No.1 male player Max Lee and tournament wildcards Leo Au and Liu Tsz-Ling were all handed matchups against former winners of the World Series tournament. 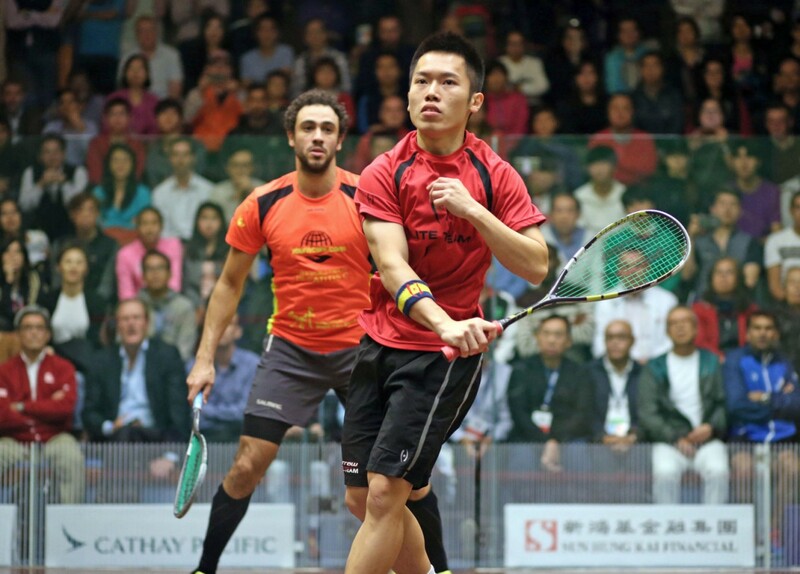 Taking place at the Hong Kong Squash Centre between November 14-19, the Hong Kong Open will be the third World Series tournament of the 2017/18 season and home hero Max Lee will come up against two-time winner Mohamed ElShorbagy in round one. Lee became the first player from Hong Kong in over 30 years to reach the semi-finals last year and the man he lost to there, eventual winner Ramy Ashour, will aim to take out home opposition for a second year in succession when he clashes with men’s wildcard Au in round one. Ashour - who has three Hong Kong Open titles to his name - is seeded on the bottom half of the draw and could meet World No.5 Ali Farag in round two if he beats Au, while World Champion Karim Abdel Gawad is also involved in the bottom half as he looks to do one better than last year’s runner-up finish at the hands of Ashour. World No.1 Gregory Gaultier is seeded first for the tournament and he begins his campaign against fellow Frenchman Gregoire Marche, who collected a third successive Open International de Squash de Nantes title earlier this month. 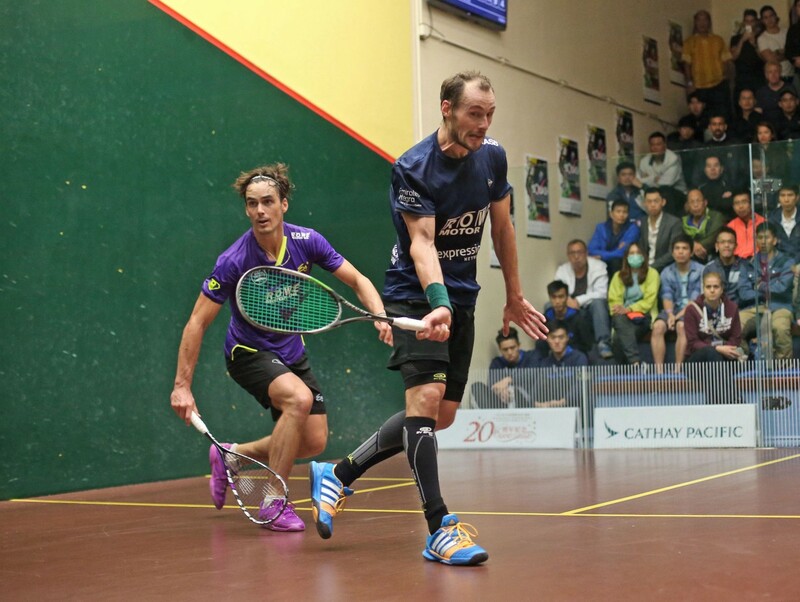 Gaultier is yet to taste success at the Hong Kong Open - losing in five finals - and, if results go according to seeding, he will meet ElShorbagy in the last four for a place in another final. Women’s wildcard Liu will take on defending champion Nouran Gohar in round one of the women’s draw, with Gohar seeded to meet World No.1 Nour El Sherbini in a mouthwatering quarter-final fixture. Elsewhere, England’s Laura Massaro opens up against a qualifier and is seeded to meet El Sherbini in the last four, while the bottom half of the draw also features a host of world-class talent, with Raneem El Welily, Camille Serme, Nicol David and Sarah-Jane Perry all involved. Two-time runner-up El Welily meets World No.24 Fiona Moverley in round one and could come up against Perry in the last eight. Perry ended a four-match losing streak to El Welily in January’s J.P. Morgan Tournament of Champions and a second successive win could see her through to face either World No.3 Camille Serme or Malaysia’s record 10-time winner Nicol David in the semi-finals, with the duo seeded to meet in a titanic last eight clash. Points for the World Series Standings will be on offer as players aim to qualify for the season-ending PSA World Series Finals - with only the top eight players on the men’s and women’s standings earning a spot at the season-ending tournament. The qualifying stages for the 2017 Cathay Pacific Sun Hung Kai Financial Hong Kong Open take place between November 12-13 at the Hong Kong Football Club. The main draw will be staged at the Hong Kong Squash Centre between November 14-16 before moving to the glass court erected at the arena of Hong Kong Park Sports Centre on November 17-19.